severely pronated feet, 12+ degrees calcaneal eversion with further collapse through the midtarsal and the tarsometatarsal joints, and a pretty rigidly abducted forefoot on the rearfoot. The patient has a history of a tarsal coalition that was resected bilaterally which took this otherwise rigid hindfoot, and loosened it up which allowed the patient to pronate even more. This resulted in calcaneal fibular impingement and pretty severe pain. 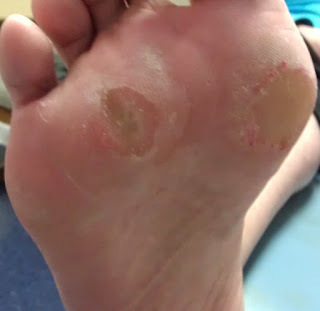 Another doctor had constructed a custom orthotic for her and, unfortunately, the patient was pronating so aggressively that she tipped her very wide poly shell orthotics (with a small 1st ray cut out) right off of the ground when viewing from behind and watching the rearfoot post. The entire orthotic was valgus! I received a question from a client today on the consultation page here on our website. This allows ProLab clients to send in questions and include pictures, MRI reports, etc. Hi Larry, I wanted your opinion on this orthotic. As you can see from the MRI he has a plantar plate rupture sub 3rd on left foot and possible neuroma in 2nd interspace. I also included the pic of the orthotic he has now which does have a small met pad, and his shoe type. Would you agree he needs to have a met pad that is bigger, say 1/2", proximal to 2nd and 3rd met heads? I would like to send you some pics. Interesting case of Cavus foot type with severe painful IPK sub 3rd bilateral. Wanted your opinion whether you see some calcaneal varus? and do you recommend a metatarsal pad behind the 3rd metatarsal. He also has IPK sub 1st but asymptomatic. Will send you castings shortly. I don't think you need to worry about the rearfoot, it looks pretty stable and rectus. This is really just an issue of getting the pressure off of the 3rd met, and to a lesser extent, the 1st. I did a consult with a ProLab client yesterday regarding a patient who was laterally unstable and how best to write the orthotic prescription. He stated that in the biomechanical exam he measured the resting calcaneal stance position as nearly 10 degrees inverted. I then asked if he had performed the Coleman block test to determine whether it was the forefoot that was holding the foot inverted, or if this patient had a rigid inverted rearfoot. He had not checked that and did not know the answer. This is a critical question when looking at a patient who has an inverted heel, so he decided to have the patient return to clinic so that he could perform the Coleman block test.